Patriots | Digital Marketing, Poetry, Reviews, Philosophy, Sports & Tales by Joe Wooldridge. Picking the winners and losers of 2017 week 1 in the NFL. Are You Ready For Some Football? The Chaos of Week 1 in the NFL. Lots of changes around the league. Are we saved now that football season is finally kicking off? The answer is yes – in a lot of ways. I will stand. I will salute. The return of Bocephus! The NFL Season Opener serves us up a classic nail-biter. 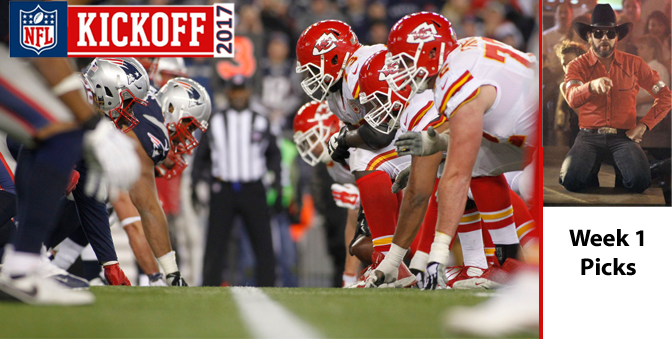 The Chiefs are strong, but the Patriots are stronger – especially in Foxborough. Mother nature dominates so strongly that both teams flee for safety, and live to fight another day. I think the Falcons are still pissed. And the Bears are not ready. A close and ugly game. Joe Mixon beats expectations and runs for over 100 yards. Steelers have a talent and experience surplus. The Browns have a lot of youth and raw talent. We know what wins here. Remember when Arizona came out flat last year and stayed flat? I do too. Carson Palmer’s arm falls off. The Houston Flood extinguishes the Jacksonville Dumpster Fire. A tough and close game. Oakland should take this one, but they are not polished enough yet on defense. The Titans pound out a win. In this NFC East slugfest, the Eagles come out strong to start the season once again. Redskins drama persists. No Luck for the Colts in week one. Goff gets a win. Sammy Watkins hurts his foot again. The Seahawks show off their upgraded defensive line by mashing the Packers. Aaron Rodgers’ mustache gets its own endorsement deal. By week nine Rodgers will join ZZ Top. Kyle Shanahan might be a good offensive coach, but the players play the game. Carolina shows what a talented roster can do to the undermanned. The Giants beat the Cowboys twice last year, and the ‘Boys haven’t forgotten that. Ezekiel Elliot gets to play this game before his suspension – and he’ll be looking to lay down strong dibs on that starting job. ARE YOU READY FOR SOME FOOTBALL??!? BOCEPHUS IS BACK! The Saints roll into the Purple Stadium and roll out with a “W”. Adrian ‘All Day’ Peterson runs for 150 yards. Philip Rivers puts on a show of how to beat Denver at Denver (like he has many times before). Keenan Allen makes some plays, Antonio Gates gets two touchdowns. Broncos Defense scores two touchdowns as well. John Elway wishes he’d actually brought in a better quarterback rather than standing pat.